For groups doing only teleradiology or other outside reads, RIS may not best meet your needs. A growing number of practitioners are contemplating life without a RIS. It’s not that these systems have outlived their usefulness, but for teleradiology outfits and imaging centers that perform only outside reads, they aren’t essential. In fact, says Isaac Aronov, head of development for Integrated Document Solutions (IDS), for a facility that reads images from multiple sites, using a RIS to coordinate that data is extremely complex. “There are just too many places where you have information coming from, and having one RIS to manage it all is technically not manageable,” says Aronov. To deal with this problem, IDS’ Web-based AbbaDox platform provides a unified pipeline from the imaging centers to the radiologists. IDS’ system can retrieve data from multiple modalities spread across dozens of sites and funnel it to a single worklist. It also allows reports to be distributed through the pipeline, helping maintain continuity throughout the reading loop. To fulfill the document management functions that a RIS would typically handle, AbbaDox can distribute forms, tech sheets, templates, letterhead, e-mail invitations, and final reports. Yaniv Dagan, CEO of IDS, says this method addresses some of the significant challenges associated with teleradiology without incurring the expense of a RIS. While most facilities aren’t going RIS-less yet, Dagan contends centers that mainly read don’t need all the bells and whistles a RIS provides. Imaging On Call has been working with IDS’ AbbaDox for about a year. Sean Kowaliw, executive director of information systems for Imaging On Call, says not all of the hospitals they work with generate unique accession numbers, but Imaging on Call’s PACS can modify the accession numbers to create a unique number and AbbaDox is able to pick them up and deliver a report that’s connected to a specific patient. With more than 90 clients spread across the country, a unique accession number is essential. Imaging On Call also has a completely remote workforce. Thirty-five radiologists read studies and 13 workflow coordinators direct traffic, but none of them work in the same building. For this reason, credentialing and dividing the workload are big challenges. The ability to spread work evenly among the workforce eliminates “cherry picking.” Eventually, Kowaliw would like to assign reports automatically to reduce the possibility of error, but for now the process is working well. He says that even if he had a RIS to coordinate workflow, there would be quite a bit of unused functionality. But even centers with a single radiologist are finding the RIS-less environment to be useful. Although Community Diagnostic Center of Brandon (CDCB) in Florida uses a RIS for its own imaging, it prefers to go RIS-less for outside reads. The facility has been using AbbaDox for 2 1/2 years. The center is owned by Paul Velt, MD, who, as the only radiologist, does the center’s own reads as well as outside reads for an internal medicine group, a family medicine group, and a couple urgent care groups. The center also contracts with an outside group to handle their overflow. James M. Lowrance, CDCB administrator, says outside radiologists can interface to the same format as Velt, which provides consistency in the reporting process. Once the outside radiologist reads the study, it is faxed or e-mailed via a secure connection to CDCB with scanned paperwork and bar codes attached to the files. To stay on top of things, Lowrance can remotely check on the facility’s operations. Health Level Seven International (HL7) interfaces allow CDCB’s referrers to access the system, and Lowrance says he’s gotten positive feedback from referrers about this feature. Using secure logins to the center’s document software, referrers can view the necessary files in one place rather than hunting for them in multiple programs. Kowaliw says his clients have also been pleased with the ability to create HL7 interfaces. Another feature they appreciate is the automatic faxing of reports. He says most emergency department doctors prefer to receive the reports via fax, and they used to have to be sent manually. Automatic faxing reduces turnaround time. In addition, the reports are faxed on custom templates, so they’re on the hospital’s own stationery rather than that of Imaging On Call. This seamless quality not only allows clients to receive reports in a way that’s less disruptive for them, but it also minimizes disruptions to radiologists. Instead of using different workflows for different clients, a universal workflow is followed. Lowrance says allowing the radiologist to work as efficiently as possible makes good business sense. 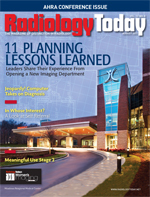 Many businesses are trying to streamline these days, but the push has been particularly strong in radiology. Although imaging volumes continue to climb, declining reimbursement rates have led many radiology groups to make do with less. Anything that saves time or resources is a welcome relief. One area where AbbaDox has helped Imaging On Call is reporting. Prior to working with IDS, Imaging On Call’s radiologists were copying and pasting their reports from their dictation platform into their PACS. Now those report templates are available in the IDS application. Imaging On Call’s previous applications also didn’t allow the radiologists to scroll and dictate at the same time. Kowaliw says the time savings have been significant. And because it’s easier to distribute data among multiple systems, CDCB has saved a sizable amount on paper costs. Lowrance says there will be even more cost savings when the center rolls out e-signature capability to its patients, but for now he says most patients prefer paper documents. He estimates that 30% to 40% of CDCB’s patients are retirees. But perhaps the biggest savings has been in the ability to redeploy workers. Rather than cutting numbers, the CDCB has shifted roles. Although technological advances may eventually encroach on specific jobs, Lowrance says he has yet to lay anybody off. One area of the RIS-less environment that is still evolving is analytical reporting. Analytical reports help facilities track their business operations. For many imaging centers, including telerad providers, a RIS is the source of those reports. Kowaliw says Imaging On Call is always looking for deeper analytical reporting. IDS has built out some reports for Imaging On Call, and Kowaliw expects to continue adding more as the business grows. Some of the reports that Imaging On Call currently uses are a daily report for its management team detailing the number of exams it processes by modality, hospital, and radiologist, which helps them track how many total exams were read the previous day and how many exams each radiologist read; and a report that tracks case level and turnaround time, which is compiled daily and monthly. Dagan describes IDS’ reporting approach as a hybrid between a PACS and a RIS. IDS’ customized reporting applications can measure items such as RVUs, turnaround times, and virus codes in real time. They can also track specific workflows. Dagan says these types of reports help facilities respond proactively to business needs rather than reactively when they look at financial reports. Aside from the usual adoption issues, Lowrance and Kowaliw say they haven’t had much trouble integrating AbbaDox into their workflow. Although Imaging On Call’s radiologists were initially reluctant to change their reporting habits, Kowaliw says the company’s 30-minute turnaround time was all that was needed to convince them to switch. And Lowrance says the improved flexibility of its operation has allowed CDCB to increase productivity. While the RIS isn’t going away, the current economic climate may convince other teleradiology and outside reading facilities to explore RIS-less options.